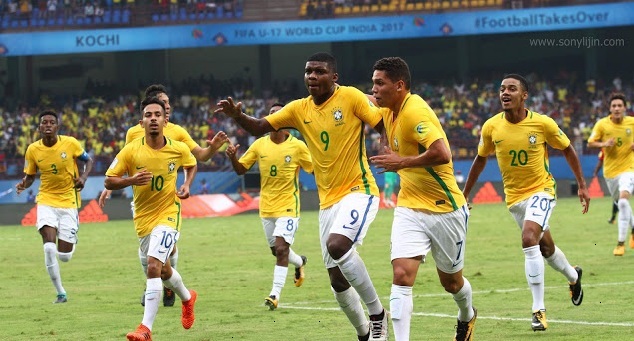 Brazil vs England Live Streaming Semi Final Football Match Preview Of FIFA U17 World Cup. FIFA U17 World Cup semi-final match between Brazil and England has been transferred from Guwahati to Kolkata. This match is due on Wednesday 25 October. Given the poor condition of Indira Gandhi Athletic Stadium in Guwahati, the local organizing committee of FIFA and U-17 World Cup Cup has taken this decision. The final of this tournament is to be there too. In a statement issued in FIFA, “Following FIFA’s full assessment of the grounds of Indira Gandhi Athletic Stadium in Guwahati, which has been affected due to heavy rain in the past few days, the replacement of the semi-final match between England and Brazil on October 25 It decided to organize it in the Yuva Bharti Kridangan in Kolkata, where the match will be played from five o’clock in the evening. According to information, there has been continuous rains in Guwahati since last few days. Between Mali and Ghana, the quarter-finals match was also played in the rain. Ghana’s team complained of the worst conditions of the field after losing 1-2 to the match. Ghana’s coach Pa Quasy Fahin had said that the match should have been postponed and should have been played on any other day. During that match, water was flooded in many places, so that the pitch was full of mud in many places. The ball was stopped by going to these places and the rhythm of the game was getting affected and the players had a lot of trouble with it. How to watch Brazil vs England Live Streaming FIFA U17 World Cup Tournament Match ? Sony Ten is a official broadcaster of FIFA u17 world cup series. Sony Ten 2 and Sony Ten 2 HD live broadcast Brazil vs England today football matches. Sony ESPN and Sony ESPN HD also live telecast England vs Brazil today U17 world cup football match. All football friends can listen Hindi and Bengali commentary on Sony Ten 3 and Sony Ten 3 HD respectively. www.sonyliv.com is a give live coverage of today semi final football match of FIFA U17 World Cup.